First time is the charm! 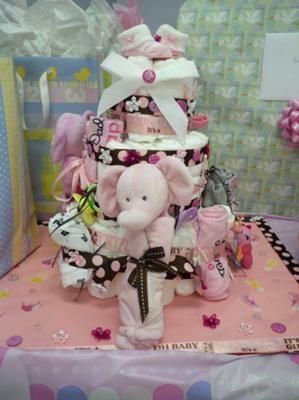 Tara made her very first diaper cake and it turned out so cute! We hope you enjoy her photograph and her details below. Our readers, like Tara, are fabulous! Creative ideas, cute pictures, and taking the time to share it all - our readers definitely give of themselves to inspire all those searching for cute diaper cake ideas. Thanks so much for sharing your cake Tara! 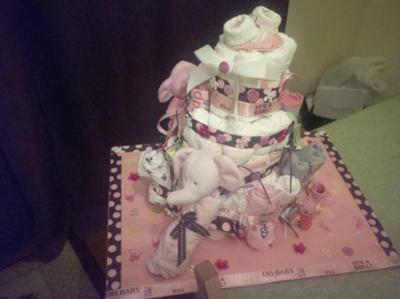 If you have a diaper cake that you'd like to share, we'd love to post it to our diaper cake gallery. Send it to us right here!. 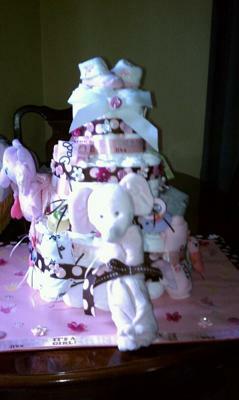 I came to this site to look for ideas, I had never made a diaper cake before. It was suprisingly easy! I followed the directions that I found for putting together the basics. My little sister's shower didn't have a theme so I just picked things I liked. I bought lots of pretty ribbon, flower accents, buttons, and a glue gun and just started decorating. I added onsies, pacifiers, bibs, toys, and a baby blanket. For the base I took a sturdy piece of cardboard and wrapped it, then decorated that with ribbon, stickers, flowers and buttons. I topped it with a pair of newborn socks. It was a big hit and looked great for my first one! Thanks for the help with directions on this site.